She just won’t let up… enjoy the next few days of relative calm because the Atlantic is going to throw more storms at the UK Friday and through the weekend, so bonfire goers and organizers please check forecasts for details as they emerge! For the SE and Reigate it is looking wet and windy with Friday being possibly very wet indeed in the SE with a weak Jude-like copy-cat appearing from the SW. By no means as strong as Jude, but it has uncanny similarities. Saturday sees a monster appear to the NW. It has a deeper central pressure than Jude had when she left but, crucially, this one FILLS and weakens as she crosses the UK. 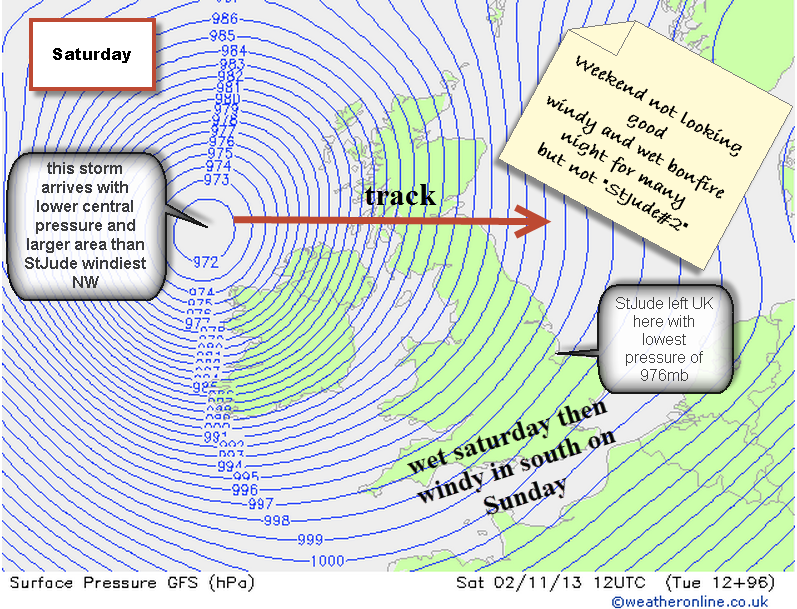 Very tight isobars off shore will give NW UK a bashing on Saturday and the SE and E windy conditions on Sunday. Wind speeds will be less than Jude for us but still pretty blustery. These two storms may well pour cold water on bonfire night for many around the country. Things still uncertain about this family of LOWS so check forecasts and details as they emerge.